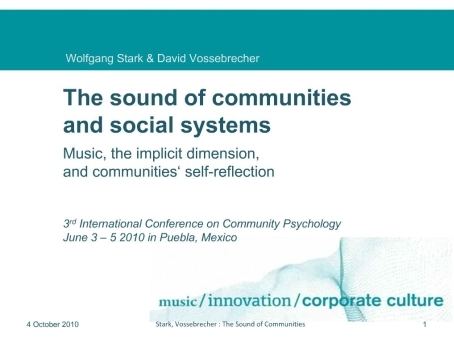 Die Präsentation des MICC-Projekts bei der Tagung “3rd International Conference on Community Psychology” in Puebla/Mexico im Juni 2010 von David Vossebrecher und Prof. Wolfgang Stark finden Sie hier als Flash-Film. Bitte klicken Sie zum Start auf das Bild…Das zugehörige Abstract finden Sie unterhalb des Bildes. Despite interdisciplinary research efforts, questions remain about how social systems and communities succeed to contribute to wellbeing, quality of interactions and work. Social systems (i.e. communities, organizations) are often described in terms of quality and quantity of connections and interactions, but there is more: a complex culture guides members’ actions and values (Schein 2004). This complex can only partly be ‘put into words’. It is barely expressible in language (or graphic representation), as there is a deeper, implicit level. In a research project on organisational culture (and learning) we develop ways to use music to foster self-reflection and to explicate implicit knowledge (Polanyi 1962) within social systems like organisations, corporations, and communities of practice. Based on a qualitative case study methodology, we investigate the patterns of interaction, participation, cohesion, values, action, and innovation. In order to work with implicit, ‘deeper’ levels of social systems, these patterns are ‘translated’ into music language as a base-line for the ‘sound of communities’. And vice versa, we use musical language to expand reception and self-reflection on social systems. Our sample cases are two corporations and two non-profit organisations: a municipal network of family welfare centres, and a foundation commissioned with the social/ cultural transformation of a post-industrial coal-mining plant, formerly the largest in Europe. The multi-method research design contains semi-structured interviews, observations, narratives/ organisation stories, visual methods, and especially developed ‘musical’ methods. Grounded Theory Methodology (Strauss/Corbin) is used for data analysis and interpretation. The presentation will discuss research design and results (preliminary), with special regard to the extension of the approach to a larger community level, which is highly relevant for CP. What is the difference between communities and other forms of social systems? How can the ‘sound of commu-nity’ contribute to sense of community and to the growth of community life and resources? Polanyi, Michael (1962). Personal Knowledge. University of Chicago Press. Schein, Edgar (2004). Organizational Culture and Leadership. Jossey-Bass. Strauss, Anselm; Corbin, Juliet (1990). Basics of Qualitative Research: Grounded Theory Procedures and Techniques. Sage.